On Tuesday night, my husband Gabe and I went to the opening night of Broadway’s CHICAGO at Straz Center Tampa. I became a fan of CHICAGO in 2002 thanks to the Academy Award®-winning film movie starring Richard Gere, Renée Zellweger and Catherine Zeta-Jones (the movie was based on the stage musical). 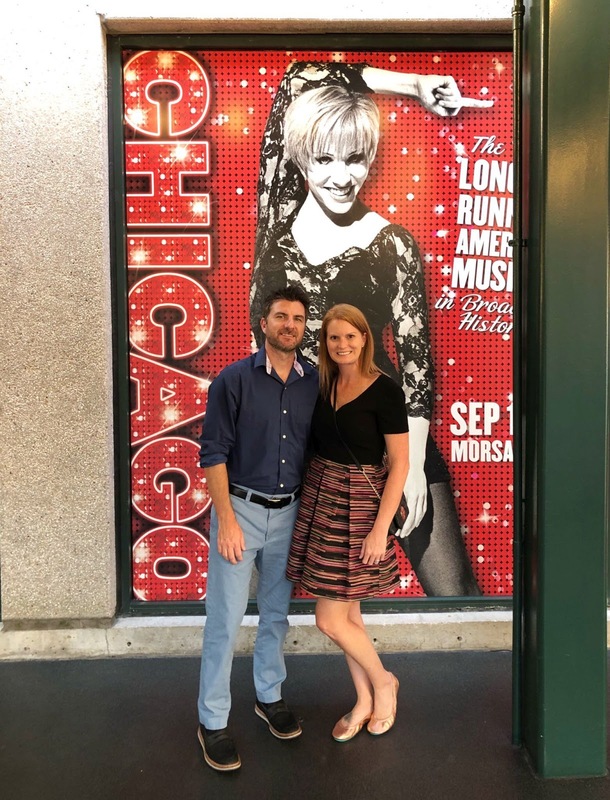 At that time of my life, I had never been to a Broadway show (aside from Annie when I was 5 years old) and seeing CHICAGO quickly became a bucket-list for me. From the opening act, the songs and dance captivated the audience. I recognized the majority of the songs from the movie and the cast did an amazing job with them. This is a true musical, where the show goes from song to song. The singing and dancing was non-stop and CHICAGO dazzled me. What I loved most about the show is that CHICAGO has a bit of everything - fame, fortune, lust, betrayal, love and of course "all that jazz"! One of the very unique parts of this musical is how they integrate the orchestra. The CHICAGO orchestra is actually part of the show and the main part of the set. The cast interacts with them throughout the night and it was really neat to see them play. If you aren't familiar with the story of CHICAGO, it is based around two woman named Velma Kelly and Roxie Hart who were arrested for different murders (Velma murdered her sister and husband and Roxie murdered her lover). The girls end up with the same lawyer, thanks to the jail Mamma, who makes side money for selling their fame to the press. The story follows their lawyer as he decided to take on both cases which ends up becoming a media circus of headlines. The women fought for the spotlight and pulled a ton of tricks not to be outdone against one another, all for the final prize of fame and fortune (and of course to be freed). I could clearly see how CHICAGO is the recipient of six Tony Awards®, two Olivier Awards, a Grammy®, thousands of standing ovations and now the No. 1 longest-running American musical in Broadway history. Tuesday, September 18, 2018 | 7:30 p.m.
Wednesday, September 19, 2018 | 7:30 p.m.
Thursday, September 20, 2018 | 7:30 p.m.
Friday, September 21, 2018 | 8 p.m.
Saturday, September 22, 2018 | 2 p.m.
Saturday, September 22, 2018 | 8 p.m.
Sunday, September 23, 2018 | 2 p.m.
Sunday, September 23, 2018 | 7:30 p.m.